* Bimmer has always liked pillows (random, right?) but it's on overdrive right now. One of her near nightly activities now is to make a "pillow house." This basically involves us barricading her against the headboard on the bed surrounded by all of the pillows. She loves it. Sometimes she calls it her "castle" and we have to get out her toy T-Rex to be the "dragon" or we have to pretend to be the big bad wolf and try to blow her house down. My favorite is when she requests for me to build a pillow house with windows. Still haven't wrapped my brain around that feat of engineering yet. * She continues to be super polite - even more so than I actually need her to be. Does that make me a horrible mom? Ya see - I don't like to be called "ma'am." I just hate it. I understand that it's a southern thing I just need to accept (and I do say it in business) but I just don't need my child telling me "Yes ma'am." But I don't want to break her of it either so that she does still say it to other people. I suppose it's better than the opposite... although she does sometimes now at restaurants ask the waitress, "You go get my drink now?" or "You bring me my food?" Thankfully, she always poses it like a question or else she would sound super rude! * With it being fall, she is now always talking about "the football game" or saying "Go Gamecocks!" Last year, whenever she saw anything associated with Halloween, she would say "Boo!" Which was super adorable, of course. 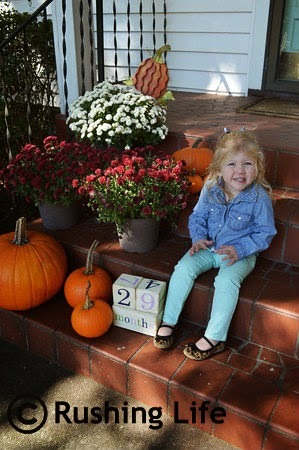 This year, my favorite is that she pronounces pumpkin like "punk-man." Yes, I am encouraging it and not correcting her. Why would you correct that? * On the same note as her being too polite, sometimes she apologizes too often for things she doesn't need to tell me she is sorry about. However, once again, is this really a habit I want to break? Probably not. She is mostly very agreeable these days when you ask her if she wants to do something and she'll scream "OK! Let's do that!" She has also started saying "you guys" or "us guys" as a generalization of multiple people. I am totally OK with this - because it's better than her saying "y'all." * We had a follow-up ENT appointment this month to re-evaluate if she needed a second round of tubes. The verdict? No! For now anyway. She has only had one infection in the past 7+ months and she had no fluid at all this last visit, so that's a step in the right direction. She was 35 1/2 inches tall and 31.5 pounds. I feel like she hasn't gained too much weight since the last time she was weighed, so that's good. Now if she would just start to rid herself a little bit of her belly. Unfortunately, her mommy and Papaw have that same belly - so she is probably destined to keep it. I hate that for her. * Her speech seems to be improving every single day. She speaks in mostly coherent sentences. Sometimes her brain is working faster than her mouth, so she stutters on some words, but nothing major. I'm not worried about it at this point. She knows all of her ABCs and is able to recognize a lot of them too if you ask her to find the "C" or the "S." She knows a few on immediate recognition as well. She is also now starting to know the sounds the letters make. If you ask her what an "S" says she will say "sssssss" or a "J" makes a "juh-juh" sound. * A few of my favorite things she is saying these days are "muddle" (instead of puddle) and "good end" (instead of the end) at the end of a book!